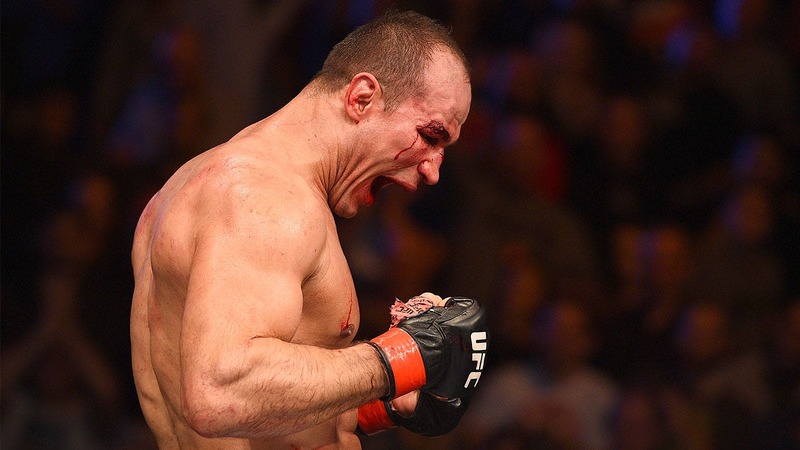 Junior Dos Santos put on a masterful, five round clinic to batter Ben Rothwell over 25 minutes to win a lopsided unanimous decision to cap off the UFC’s first trip to Croatia. It was a must win situation for Dos Santos after suffering a loss to Alistair Overeem in his last fight but now the former champion can reclaim his spot in the top five and begin stalking a title shot again in the future. While Dos Santos certainly harnesses one punch finishing power in his hands, it was his speed and footwork that put him in a position to not only win but virtually pitch a shutout over the No. 4 ranked fighter in the world at heavyweight. Recognizing the power Rothwell possesses, Dos Santos circled and stayed on the outside at all times throughout the first round while peppering away with body shots and quick stinging jabs. Rothwell stalked the former champion across the Octagon while constantly looking to slam home a knockout shot to put a stop to the fight. 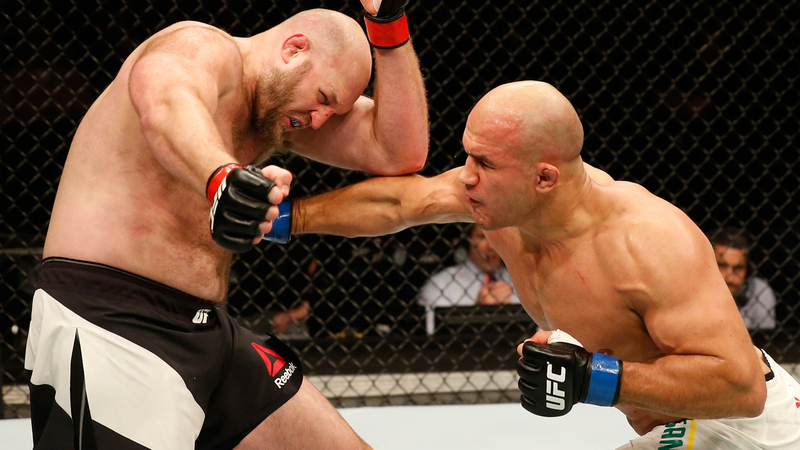 While Rothwell landed with power, it was Dos Santos’ quickness that continued to win him the exchanges in the early going as he got in and got out before taking too much damage. Dos Santos continued to pop shot Rothwell in the second round with straight punches that opened a cut over the Wisconsin native’s right eye. Dos Santos’ confidence roared as the minutes ticked away and with a matter of seconds left in the round, he unleashed a vicious right hand that hurt Rothwell before landing a front kick that put the big heavyweight on the ground. The horn sounded before Dos Santos could follow up, but it was clear that the former heavyweight champion was surging after the first 10 minutes. Dos Santos continued his assault in the third round with constant movement to keep Rothwell guessing before cracking the No. 4 ranked fighter with quick punches to the body and head before circling away again. It was clear Dos Santos was landing the better shots and he finally planted a big left hand that wobbled Rothwel on the feet. If he was truly hurt, Rothwell refused to show it after a moment as he regained his balance and went right back after Dos Santos in the center of the Octagon. Rothwell aggressively lunged at Dos Santos again and again, but the Brazilian was masterful at backing up just enough to land a counter shot and turn away from the cage. As the fifth and final round got underway it was clear Dos Santos was up big on the scorecards, but he didn’t turn defensive in an attempt to run out time on the clock. Dos Santos was surgical with punches to the body and head over and over again while Rothwell simply couldn’t catch up to him on the feet. As the round wore on, Rothwell’s face was painted red with blood as the punishment mounted and Dos Santos put on a clinic over five rounds. In the end, Dos Santos out landed Rothwell 157-78 in total strikes through 25 minutes in the cage together. The judges all agreed and returned unanimous 50-45 scores to give Dos Santos the victory while Rothwell faces defeat for the first time in five fights. I used my boxing because guys forget about jiu-jitsu and wrestling, I’m a boxing guy! "I think we did the right strategy because you can’t go against a guy that size, he’s too big so I used my footwork to move a lot and throw some hard punches on him," Dos Santos said after his hand was raised. "I used my boxing because guys forget about jiu-jitsu and wrestling, I’m a boxing guy!" Dos Santos looked better than ever while bouncing back from one of the most devastating setbacks in his career after suffering a knockout to Alistair Overeem in his last fight. This time around, Dos Santos was very smart with his strategy to stick and move constantly over five rounds and Rothwell simply couldn’t catch up with him. With the win, Dos Santos now positions himself back into the top five of the heavyweight division and considering he holds wins over both champion Fabricio Werdum and top contender Stipe Miocic, he can’t be too far away from title contention again. As for Rothwell, there’s no shame in losing to someone like Dos Santos but it’s still a nasty pill to swallow considering the momentum he built in his last four fights. This setback will certainly derail Rothwell’s plans to fight for the title in 2016 but considering his desire to stay active, there’s a good chance he’ll be back this summer to try and reclaim his spot amongst the best heavyweight fighters in the world.